“Change is the only constant,” says the old saying. Some organizations adopt it with open arms, while others vehemently resist it. Whether it is an intention or a side-effect of the structure of the organization, one thing is certain: no one can escape change. The same principle applies to Website and digital marketing for the corporate world. In recent years, technological changes have completely transformed the way customers interact with brands. Here are some things to think about: eating, sleeping, playing sports, driving, shopping, commuting, and more with our mobile devices. In other words, mobile technology has become a ubiquitous component of our lives, an extension of who we are and an inseparable presence of everything we do. However, many brands have not yet implemented a mobile-responsive website, let alone a mobile strategy. Basically, this reveals that we are neither as focused on our customers nor as obsessed with them as we claim. Even worse, our organizations are not structured for digital transformation. 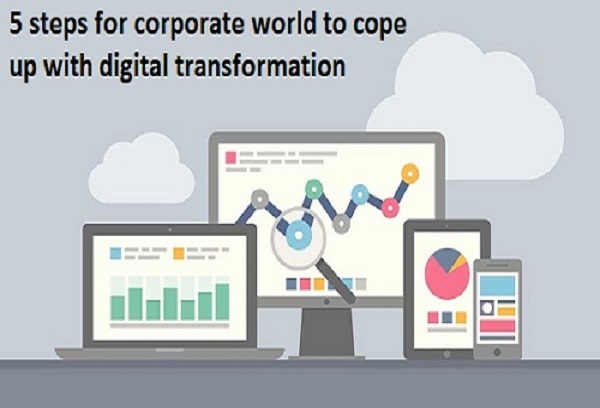 However, change is not necessarily difficult; Let’s take a look at 5 steps for Corporate world to cope up with digital transformation. Your website is the heart of the digital experience. This is true for most businesses; there are exceptions, of course, whose brands and essential features are built into applications, such as Instagram or Uber. For most businesses, however, the website is the starting point for the entire experience. In fact, we have become so used to the fact that brands have an online presence that any absence is a source of distrust among consumers, who immediately tend to go elsewhere. So, what simple and quick tips can you implement to ensure the success of your website tomorrow? Make sure your content is easy to find and the information on your website is clear so that it meets needs of your audience. Moreover, your website must be friendly, fast enough, and responsive to mobile devices? As mentioned above, the importance of mobile technology cannot be overstated. Your e-mails, homepages, and website must all meet the specific online needs and behaviors of mobile customers. We spend so much time on our mobile devices that searches from them have supplanted those on desktops. Only a few years ago, this was not the norm, but our way of interacting with devices and the evolution of our behaviors induced by technological progress is progressing at a rate never before matched. Before the age of smartphones, our research, our online shopping, our discussions, our e-mails – all this was done on a desktop or a laptop. Now back to today and the plethora of devices available, you will find that all information is accessible in the blink of an eye. So, ask yourself why your website is not responsive. Always remember: Customer behavior always differs on a mobile device and a desktop computer. Over the last ten years, the volume of commercial transactions on digital channels has increased globally, especially in the Benelux. Today’s “always connected” customers no longer talk about “offline” or “online” experiences. They want experiences that adapt contextually to their shopping needs across all channels. Today, just having an e-commerce solution is not enough – nor does it offer a smooth ordering process. We need to understand that what happens offline (from the moment the purchase was made to delivery to the unpacking process) contributes to the total customer experience. We define the customer experience as the sum of all the interactions, on each point of interaction, that a consumer has with your brand, as well as the perception they form. How does your brand define this experience? We need to move away from offering a “sensational experience” on each channel and understanding that customers do not see the channels. They simply see a disconnected experience, regardless of its quality on each individual channel. The customer experience must be a connected journey, not a fragmented puzzle. The most difficult step to implement, and yet the most powerful, to accomplish the digital transformation is to change the corporate culture. Setting up multi-disciplinary teams within your organization, all contributing to the customer experience, will boost the process and generate greater business value. Ultimately, this is a change of mind within your organization, promoting the adoption of a people-oriented strategy, rather than single devices or disconnected channels. The step towards humanizing your marketing is both complex and rewarding, and that’s where the digital transformation begins. ← Mobile App: Why It is Matter of Growth for Your Business?